We love desk accessories and all the beautiful things that make your desk and environment an inviting place for social correspondence. And, we are big fans of John Derian's découpage trays. Derian is a leader in the art of découpage. He uses color reprints of 18th and 19th-century images from his own personal archives and pieces them together under glass—often in combination with antique calligraphy. 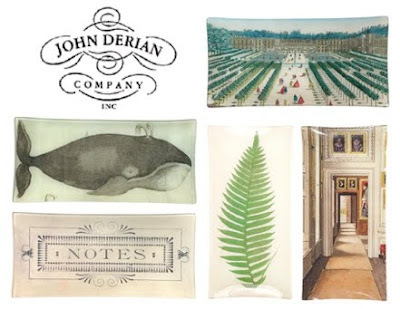 The John Derian Company was established in 1989—the handmade designs are created in Derian's New York City studio, where he employs a small staff of artists who assist with production. We particularly love the Pencil Trays [$92], which are perfect for holding writing instruments, ink, stamps, and more. To purchase, call 212-677-3917 or visit John Derian for a list of retailers. 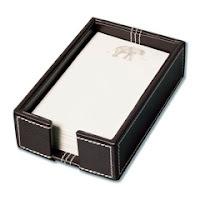 Jotter Cards are also perfect for desks and make wonderful gifts. 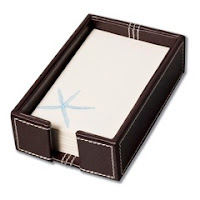 From our Vera Wang collection—Leather Jotter Gift Sets, Blue Starfish, Elephant & Telephone.